Still mild and with winds from the south again, recorded another bumper catch on the farm, with 73 Moths of 21 species with a few migrants including a good amount of Setaceous Hebrew Character, 1 Dark Sword-grass and a first for me in the UK, a Pearly Underwing! 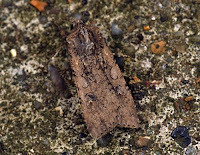 very happy with this rather non-descript Moth that looks like a worn Dark Sword-grass! 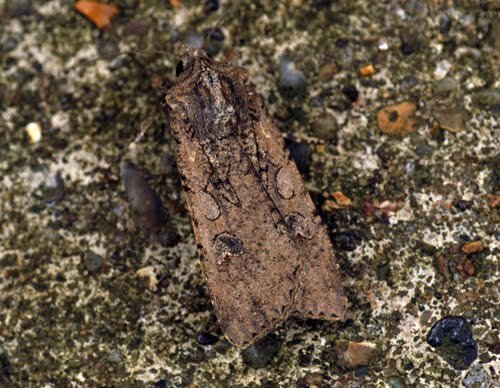 It's not a rare Moth by any means but I believe it is the first to be recorded this year for Hertfordshire. A night break last night because of Halloween Party meant the trap stayed in the garage, but it's going out again tonight as we are in for a warm, still and dry one. I must say, you seem to be taking the rest of us to the cleaners of late Ben! Cheers Matt, well I think it's like you say due to the location, i've just checked out there after nearly 3 hours the lights attracting 1 MDJ so far, either they fly later or tonight will be a poor night! 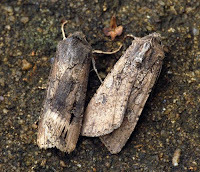 Yes only seen that species once and that was in my old house in Essex back in 2008. A Gem, Streak or Flame Brocade would be nice.